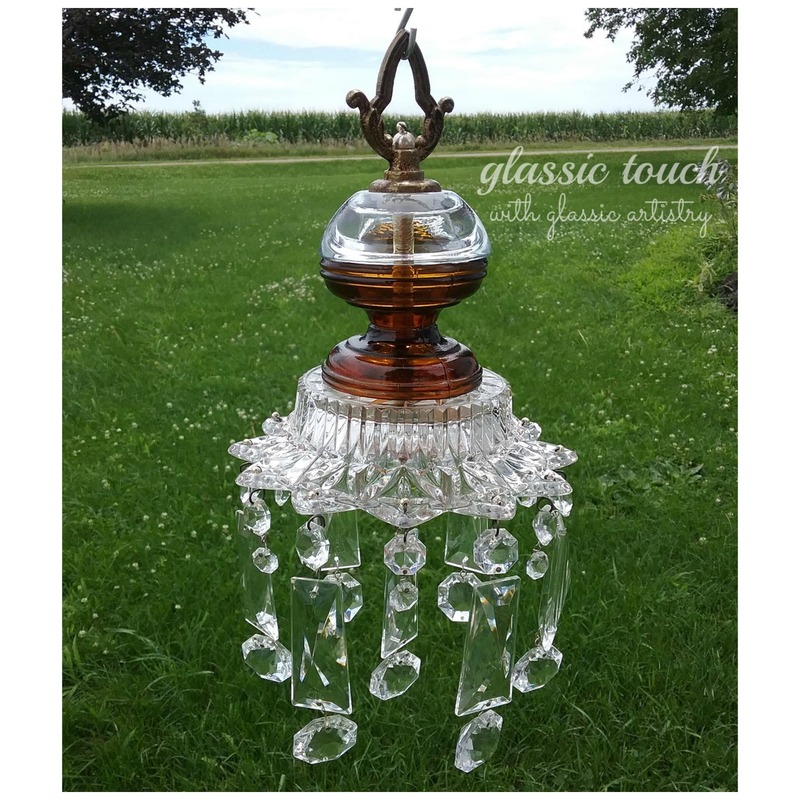 There’s no doubt about it, the old world charm of the crystal garden chandeliers has me totally captivated! I’m not sure if its the beautiful results or the fun of making something so unique and striking with reclaimed and repurposed materials, but whatever it is, I’m hooked. After last month’s post, I was anxious to try a chandelier garden stake. After laying out all of my glass and lamp pieces to see what there was to work with, I noticed several glass pieces were votive/candle holders, small saucers, and odd pieces without a hole. 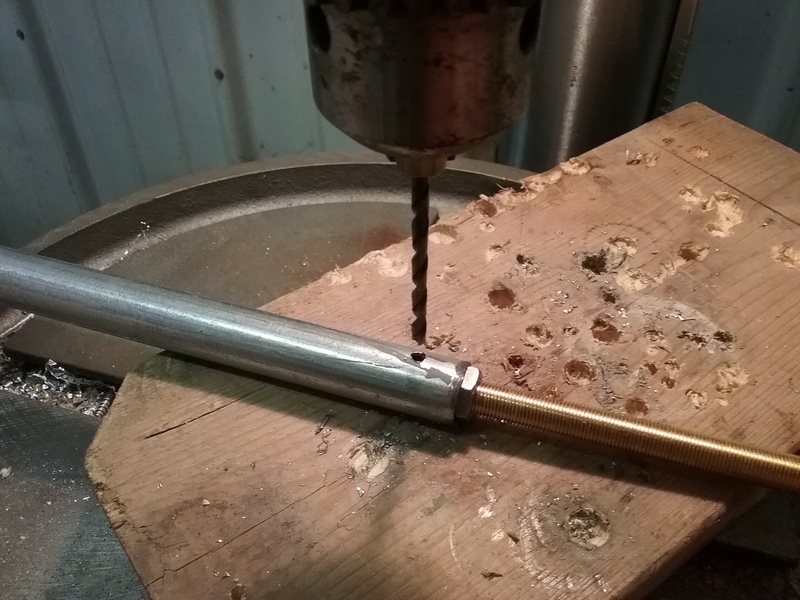 Playing around with stacking the pieces is the funniest part of this project, so I decided to grab the drill and 1/2″ diamond core bit to drill holes in pieces before getting started. 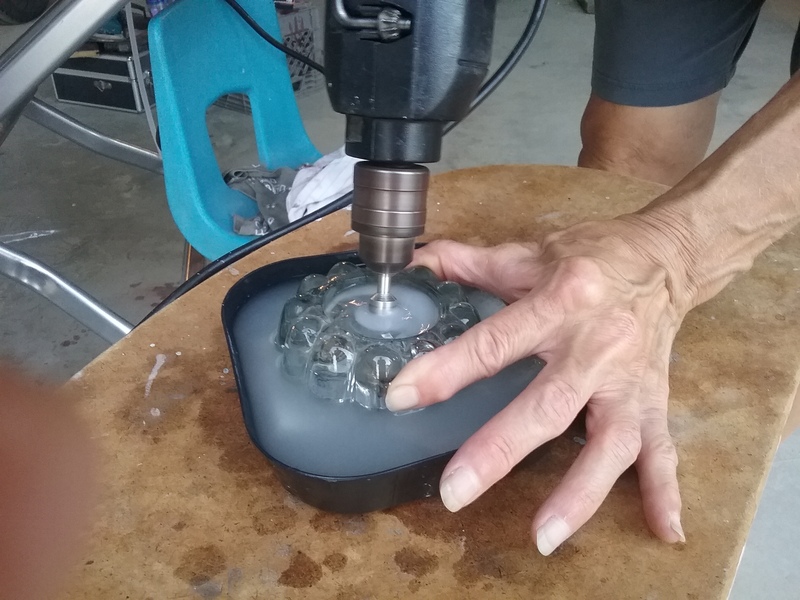 There’s a bunch of videos readily available on You Tube or Pinterest about drilling holes in glass. It is pretty simple really, just a little time consuming. 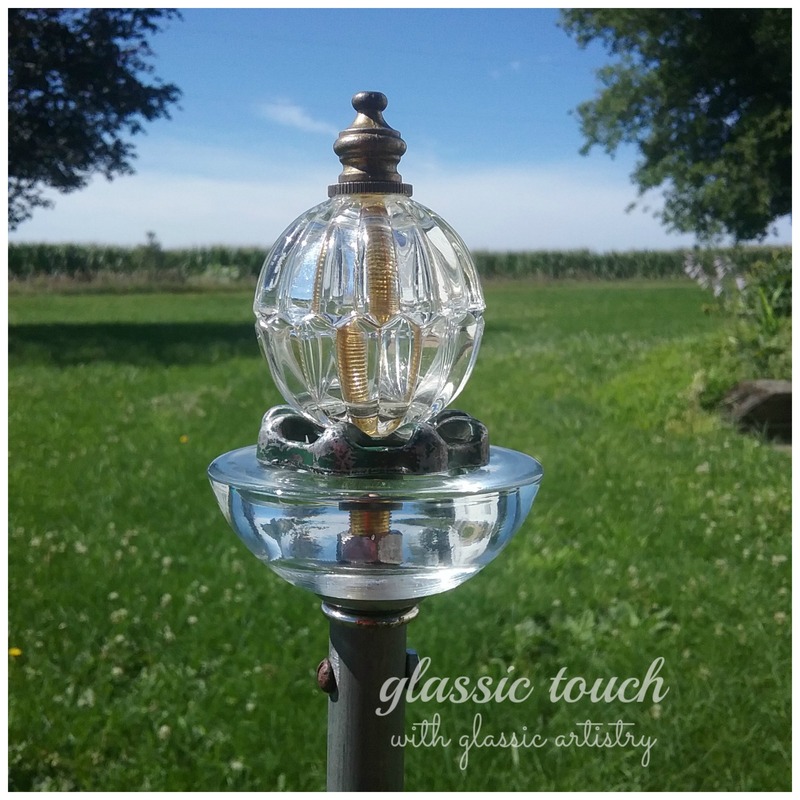 Besides being very mindful of safety issues with water and electricity, the most important thing to remember is to keep the glass wet and cool so it doesn’t overheat and break. Although the pieces are different, the garden stake is stacked and made on a lamp pipe following the same steps as in last month’s post, with one exception. Instead of marking it with tape and cutting it off, mark it with tape, add 8 inches, then mark it with tape again for cutting. 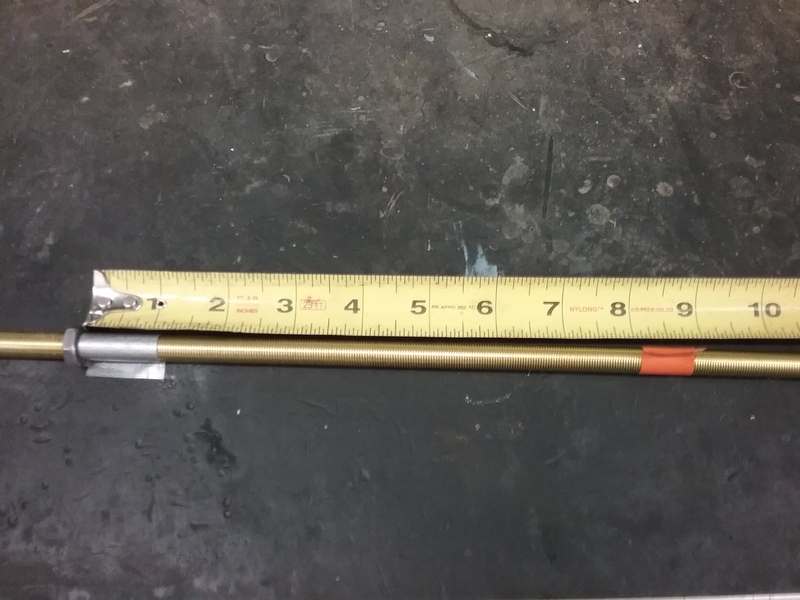 The added length will fit into a piece of conduit. Because of the crystals dangling, I wanted the stake to have some height, so I cut a piece of scrap 1/2″ conduit, four foot long. Approximately 1 inch from the top of the conduit, mark a spot for drilling. With a center punch, make an indentation on the spot. 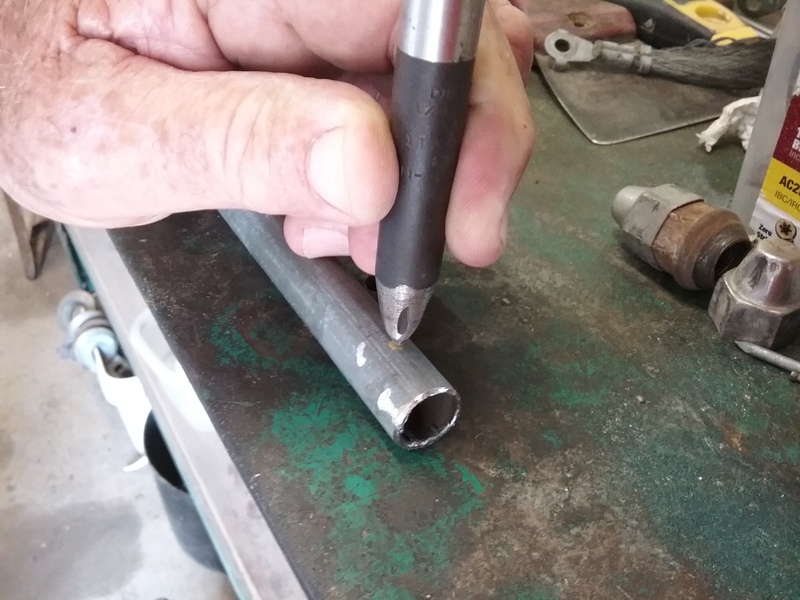 Drill a hole through the conduit with a 5/32″ bit. 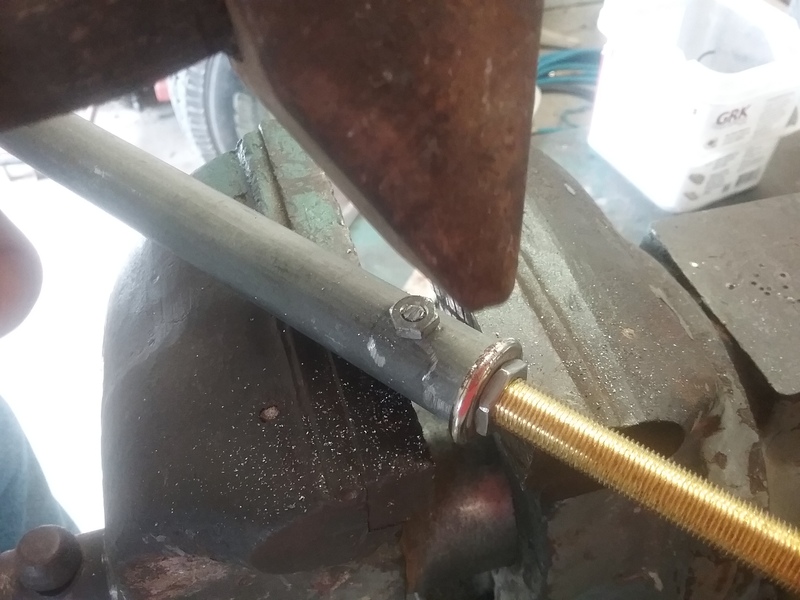 Insert the 8 inch added length of lamp pipe into the conduit until you meet the hex nut. 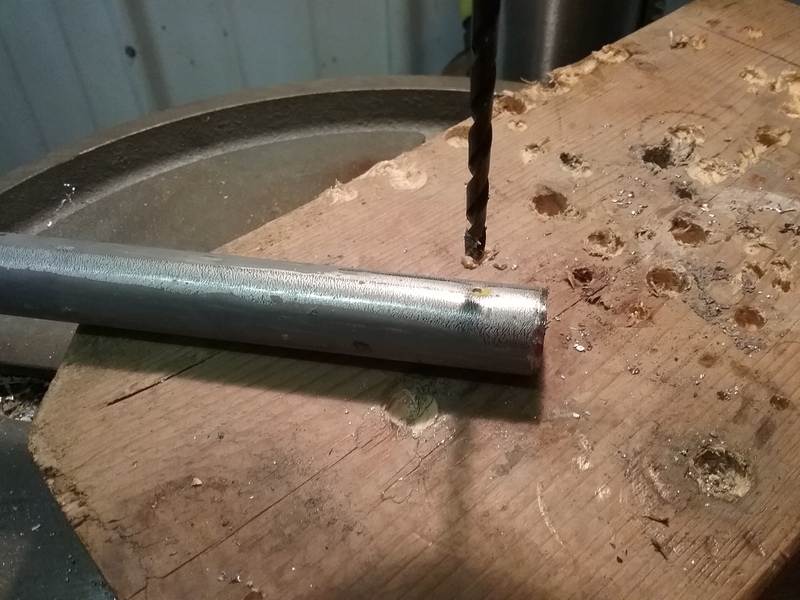 With the lamp pipe and conduit held firmly, drill through the conduit holes again. This step works best with two people, one to hold the conduit and one to hold the lamp pipe, as you drill through the second time. 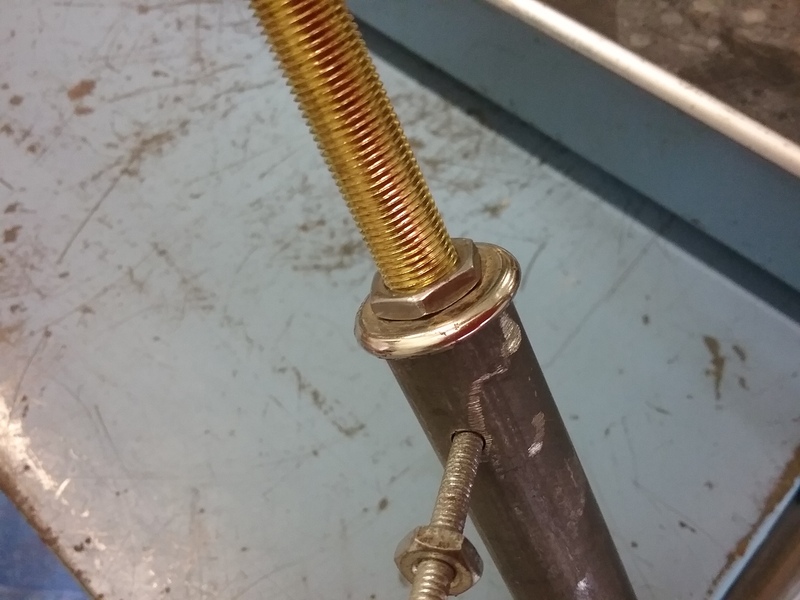 Run a small bolt through the holes and tighten on a nut. I noticed the hex nut didn’t cover the opening of the conduit pipe completely. I could have left it, but, didn’t like the look, so I added a flat, rounded edged lamp piece between the hex nut and conduit opening. 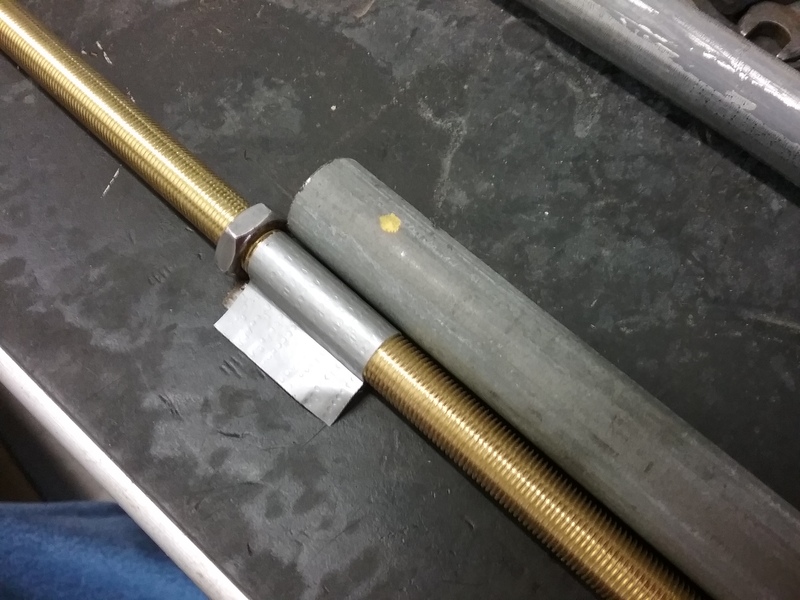 While holding the conduit in a vise, cut off the excess bolt length. 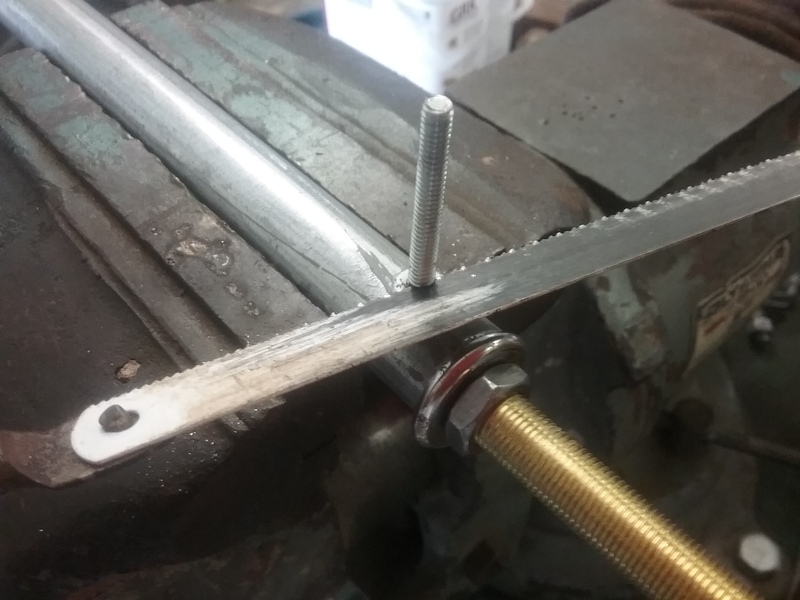 Remove it from the vise, lay on a solid surface, and hit the cut bolt end with a hammer a few times to rivet it on. Replace your stacked pieces to the top of the lamp pipe, tightening when you screw on the finial. Once together, I found it helpful to stand the stake in a bucket of sand when adding the crystals. Pretty! Pretty! No crystals? No problem! 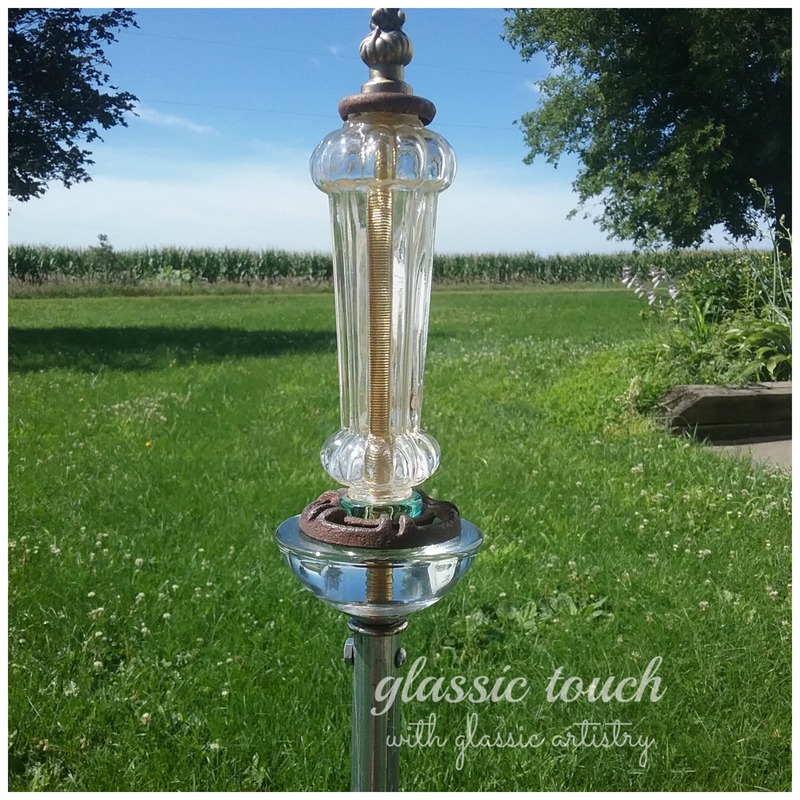 Garden Stakes can have a character and style all their own without the bling! If you like this post or found it helpful, please click on the “like” button below, or leave a comment. I love hear what readers are thinking.